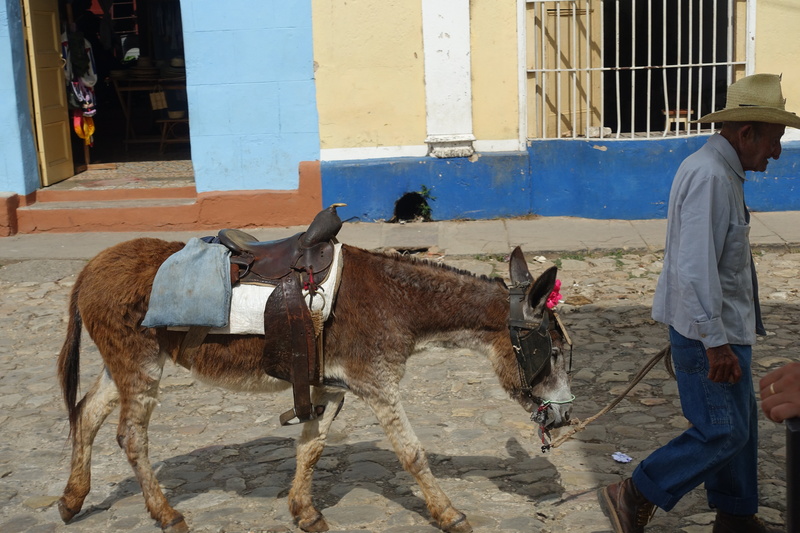 Cuba is an immensely intriguing state. It exists as a living anachronism from the Cold War era, controversial, captivating, complex. 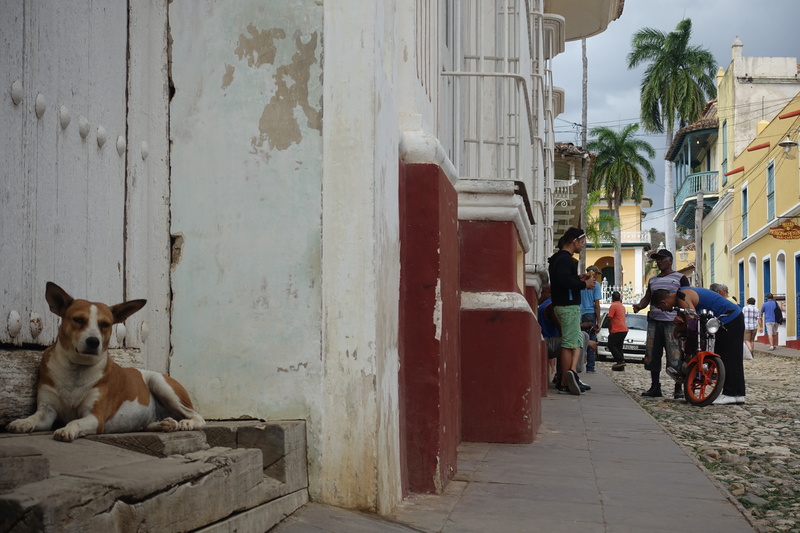 Beyond the façade of the idyllic island paradise described in Cuba 101 is a whole new world. 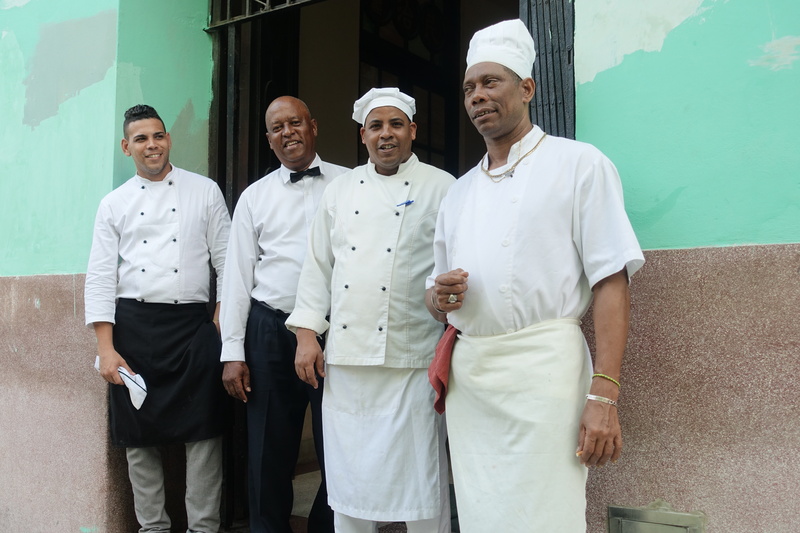 If you were to be so bold as to take a different way back to your hotel in Havana, for example, you would be quite startled. Dilapidated palace-like buildings. Hungry people. People with no or little pesos in their pockets to satisfy that very same hunger. The amount of times I was stopped and randomly asked for money was embarrassing. 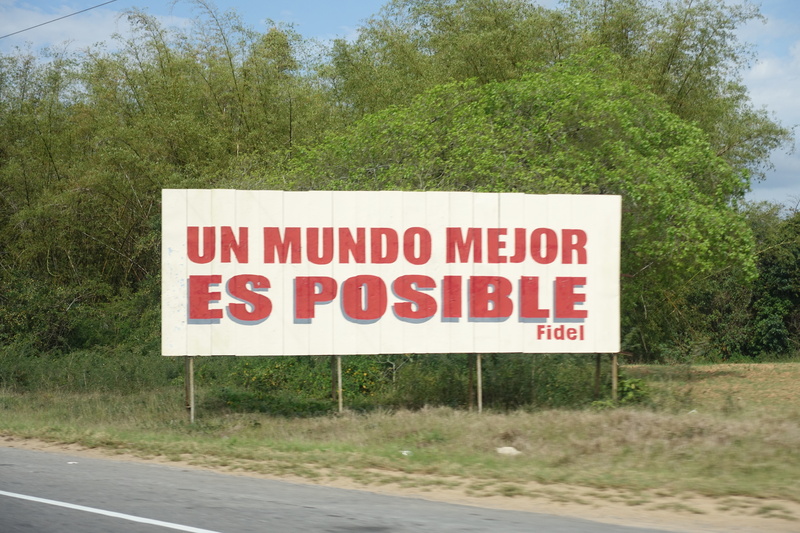 Almost embarrassing enough for someone to write a letter to el commandante Fidel. Many of your people are hungry and frustrated. Whilst 90 miles away fresh water comes at the effortless turn of a tap, here it must be sourced, boiled, chlorine added, filtered and finally poured into a mouth thirsty for change. 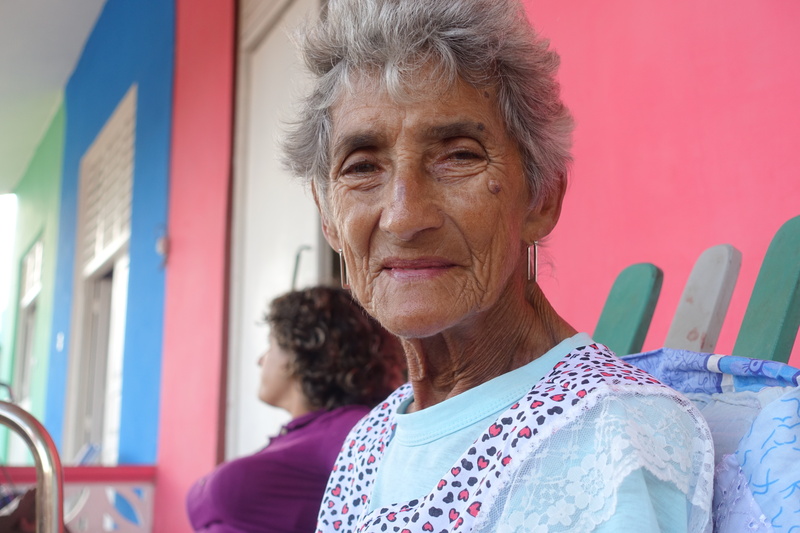 What would I know about change in Cuba? I was only there for 15 days. True. 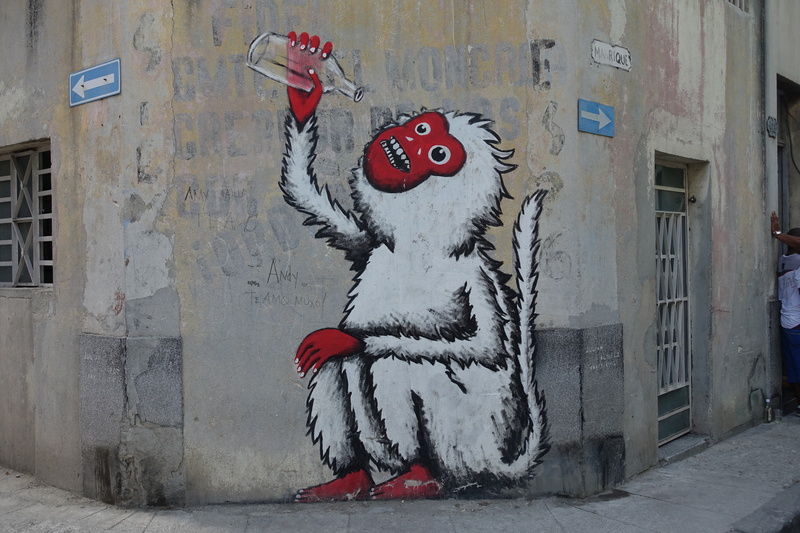 However, in those 15 days I made an effort to speak to as many locals as I could. My method was simple. After I had been small talking to the person for a while, I would raise the controversial subject, if it was appropriate to do so. I would say, Obama? I would then clench my fist keeping only my thumb extended and then raise it firstly up, and then down. I was giving them the universal signage of two options, si o no, just as the Roman emperor’s once did to spare or end a weary gladiator’s life. They understood the gesture. I never got a downward pointing thumb. This is big stuff. 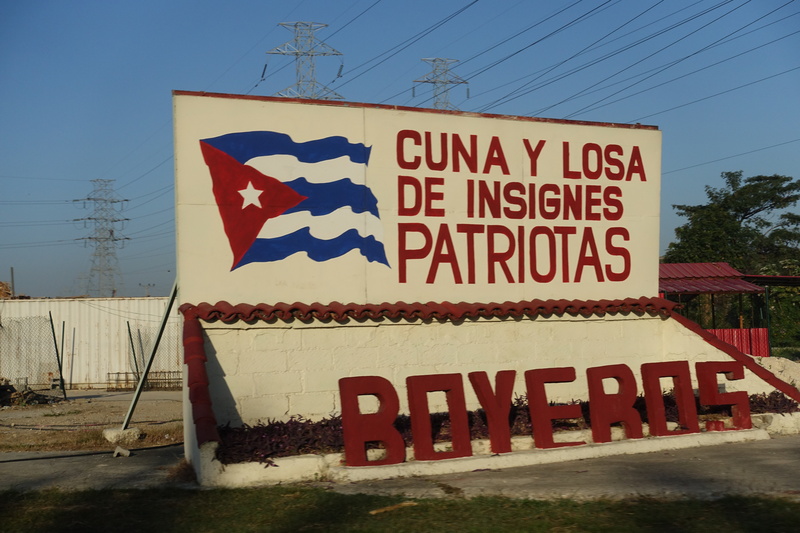 Just think, for the past 56 years the US has imposed a trade embargo on the island state of Cuba as a result of Cuba becoming a communist state. Cuba fiercely opposed the US henceforth, allowing the Soviet Union to place ballistic missiles and military personnel on its shores. Now, in 2016, thumbs up here and there and everywhere. 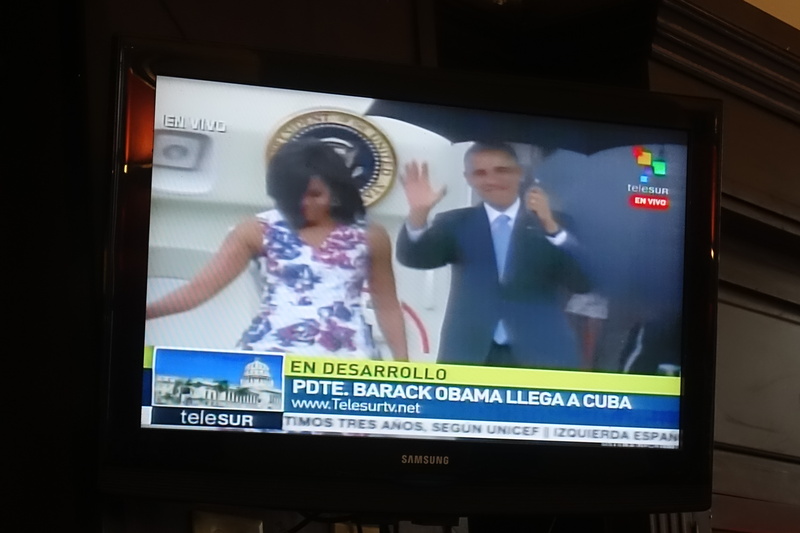 Although it is difficult to know exactly what a thumbs up means, I do not believe they were necessarily saying yes to Obama and no to Castro. 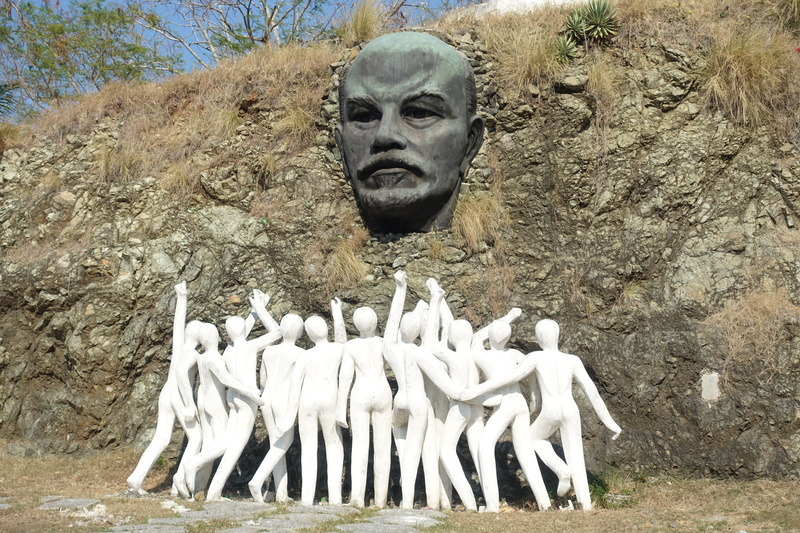 They were not saying yes to so called “liberal democratic capitalism” and no to Castro’s communism. You see Castro did manage to create a society with incredible healthcare. I believe that when I said Obama and the thumbs went up, it was a silent but clear expression for change. 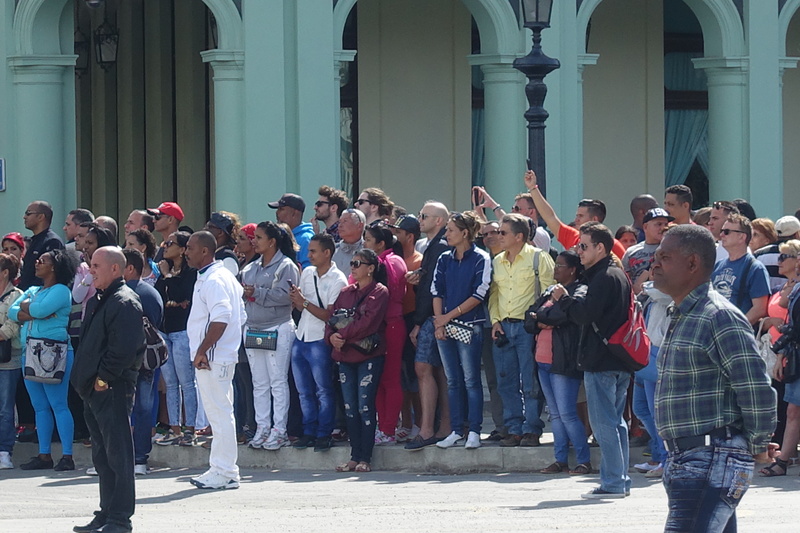 The people of Cuba want change. It doesn’t have to be huge change. Just some change. They want to be able to travel freely throughout the world. They want free, unrestricted internet. They want to have the opportunity to be able to discuss politics on the streets without being afraid of being heard. Imagine if you peered into a class of third grader’s at a primary school and instead of finding small pre-adolescent bodies, adults ready to face the world were sitting awkwardly in those silly school seats, crowded and overgrown, yet restricted from leaving the classroom or progressing to the next grade. That’s how I perceive Cubans to feel. Many feel frustrated. They are ready now, Castro. Communism was a good school master in some ways. It has taught the people patience. They know how to queue for food, for rations, for buses, for supplies. They even now know how to queue for life. But now the queue is getting edgy. Frisky as a tom cat. 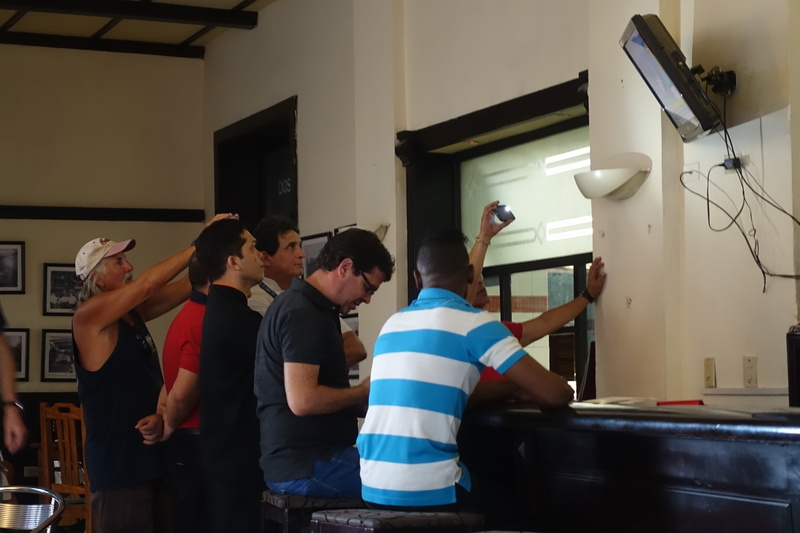 Cuba has been caught in a time warp for too long. As Obama said, it is time to bury this relic of the Cold War. In the year 1446 BC a certain man climbed steps of stubbornness to plead with Pharaoh Ramesses II regarding the future of the Children of Israel. 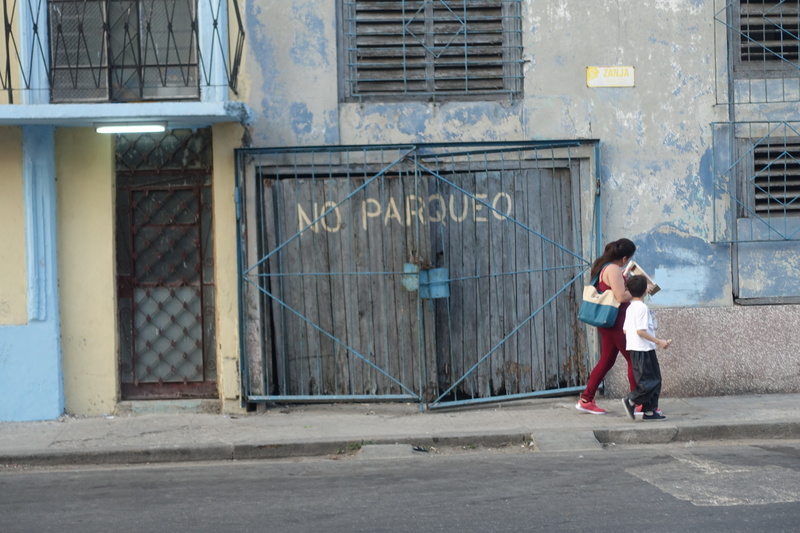 In 2016, the same plea can still be heard: Castro, won’t you let your people go? My spring break was magical, super, fantastic, spectacular, and all the other adjectives that describes the state of AWESOMENESS. Our family getaways haven’t happened in a while because our families lived apart, but now that we’ve all gathered in D.C., we thought it would be great to have a family trip together. Our break schedules conflicted as my spring break was the second week of March while that of my siblings was the third week. However, I didn’t have an option because they were high-schoolers whose absences do remain on transcripts. I had to yield to my parents and had to miss few days of school. Got a lot of catch-ups to do. But as I mentioned, my break was totally worth it. 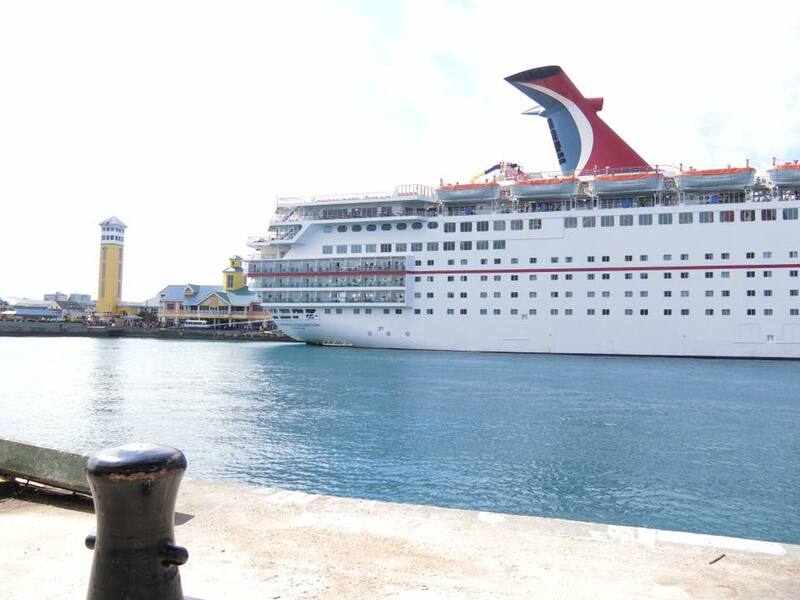 We got on a cruise for the first time, and it wasn’t even an ordinary cruise. It was a DISNEY CRUISE! Hurray! Since the ship departed from Port Canaveral in Orlando, Florida, we had to get on a plane to get there. It was not much of a long trip, but I was already tired by the time I got there. Also, we had some problems with our luggage because it was missing from our planes pick-up lane. We first thought it was stolen, but after we talked with the Disney cruise staffs in the airport, we figured out that they transferred the luggage for us and that we would have it arrive in front of our rooms. Would have been nice if they had told us in prior, but it was nice of them to do that. The cruise was a food heaven. There was no way I could get out of here without getting weight. First of all, everything was FREE. Well, not technically free because we paid beforehand, but we didn’t have to pay everything we ordered anything. We were given a menu, and were free to choose from anything on it. On my first day, I was too excited I ordered three main menus, which were steak, lamb, and chicken. I had a very tough time that night because my inner system went wrong with food overdose. But the quality of the food was so amazing that I don’t regret tasting all of the menus I have ordered. I loved how the cruise showed us musicals every night. Whenever we woke up and whenever we ran out of things to do by ourselves, there were always options available for us. One of them was the musical they showed every night, which is definitely a semi-Broadway quality. The theme differed for three nights, but I loved the one they showed on the first night. They mimicked an award showcase that Disney character had attended. I teared up a bit after the show. The best part of my trip however, was the Disney Castaway island, which could only be accessed by the people who got on the cruise. The island was so beautiful and the ocean was transparent with a tint of light-blue. My dad, brother and I got on the bicycles to take a look at the island. Just as it was developed from an unknown island, the scenery was natural and full of freshness. I also said hi to Mr. Mini-crab who appeared from nowhere. 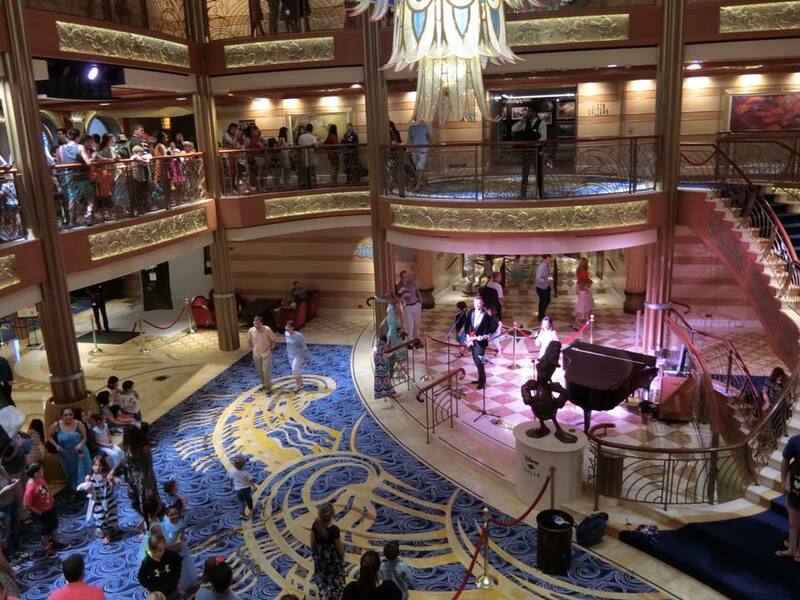 The lobby of the ship was always crowded because there were concerts going on all the time. My favorite was “Let it go” played in piano. I got sick every time I heard of that song, but the performance added a brand new taste to that cliche song. I loved it so much. The first thing I saw on the news today was 21-years-old college student sentenced to 15 years of hard labor in North Korea. All he did was taking off the poster with political slogan on it, and attempting to bring it back to United States. One of the interns sitting next to me said “Bleh, I did it all the time when I was little.” This is an unbelievable incident for such trivial issue. I believe North Korea overacted a bit in response to the hardening relationship between itself and the international community. Are they going to use this as a threat to United States? If so, I am pretty sure its not gonna work. First, I disagree that United States would do something about it. It decided to take an unforgiving policy against North Korea, including the sanctions that recently passed in United Nations with the help of China. The vote for the sanction was unanimous in the Senate, which shows that United States is determined to pursue this policy. Arrest of one American student wouldn’t make much difference, and even if they try to rescue him, it wouldn’t compromise with North Korea beyond this single issue. Secondly, I felt the exact same thing too. The world is such a beautiful place as it is composed of many countries with distinct characteristics and colorful cultures. There are so many places to visit that it would take a lifetime to travel all of them. But out of those countries, the choice he made was North Korea, and the outcome of his choice was more than unfortunate. I wondered how he even got there, but apparently, he was able to visit North Korea through a travel agency in China. This means he did put a lot of effort into his trip, and that he was expecting something out of it, which turned out to be hard labor! Lastly, I felt the same thing too. During his press conference, he couldn’t resist his emotion and cried. He couldn’t walk properly because the reality was so harsh to be accepted. He said he needed to take care of his siblings, and that he can’t be detained in North Korea for them. He asked for pardon as he is a human being who can make a mistake. I certainly do agree with him. He is young and curious, and even though his action turned out to be unacceptable by the people in North Korea, they could have just considered this as a mere mistake. Would he have enough courage to start over his life from 36 years old? Are all his young days going to evaporate at an unfamiliar, alien country? Joon Oh, an UN Ambassador from South Korea recently made an impressive statement in United Nations. In his impromptu speech, Mr. Oh, in Korean, said “As an individual with the same racial root, I urge you to stop what you’re doing.” It is time for North Korea to take another diplomatic strategy for itself, as the future ahead is pretty dark in front of them. Our trip to NY was impromptu. My friend and I just talked about going to a ‘trip’ somewhere, but we never actually took action. Our lives were so busy with heavy workload and exhausting schedules. Our desire for an ‘escape-from-reality’ grew to the extent that our lazy selves were able to put together a trip plan. We thought spring break would be an excellent time for us to go to a trip, and would also be the only time our trip would work out. A week before our departure, we got a megabus ticket for ourselves and were set to go. We weren’t tired at all Even after the lengthy five hours bus ride. After we got off the bus, we lifted our heads and counted how many buildings were just in front of us. 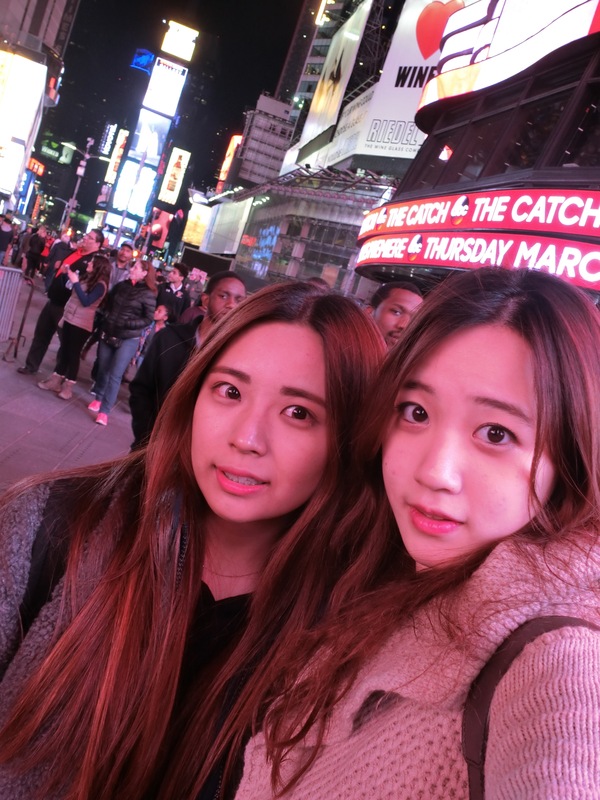 Because we’ve been in D.C. for pretty long time, we couldn’t believe we were in NY. Skyscrapers were everywhere, and the streets were overcrowded with people. There were all kinds of people with different ethnicities, fashion, hairstyle etc. Even though this is my fourth time in NY, the special atmosphere in NY always felt new to me. Times Square was beautiful as always. Even though the place was such a brouhaha, we still managed to take pictures with a decent background. The reason that we look so red is that the commercial up on the screen was mainly red. Our photo quality really depends on what commercial they are showing hahaha. We also went to the Brooklyn Bridge, the much renowned photo spot. The weather was not that great, I think the scenery itself matches well with the gloomy weather, doesn’t it? My experience up on the Brooklyn Bridge was SO AMAZING. NYC during the night is so beautiful that all of its other flaws could be neglected (The bridge is totally unreconstructed. I was so scared I would fall off but oh well). My trip to New York was short, but it made me realize how different US could be depending on the states. Even though Korea does have distinct characteristics depending on the district, I could find a lot of similarities with my own, Seoul. However, NY was nothing like DC. The color of the city, buildings, the people – there were almost no commonality except the fact that they spoke English. I truly admire how the central government operates well enough to gather the interests of these different states and maintain its status as one country. 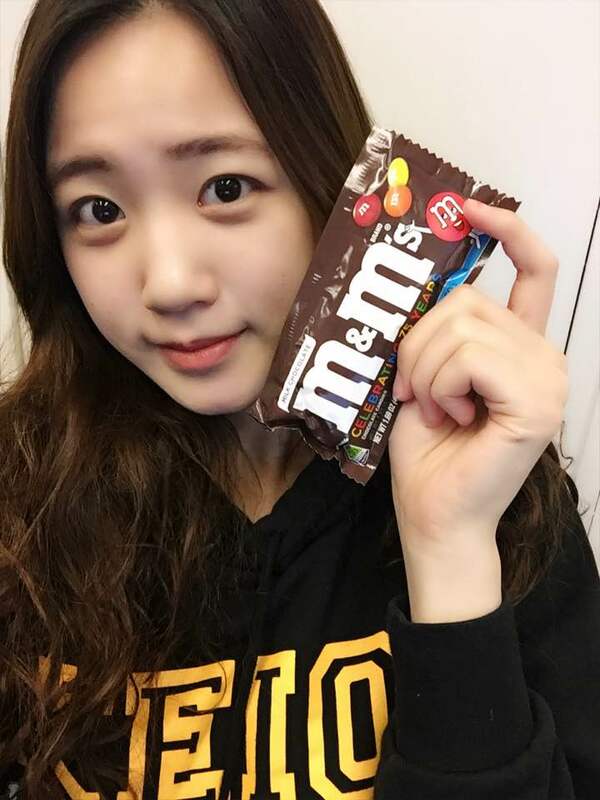 One of the biggest highlight this week was receiving free M&M chocolate at Capitol South station!!!! (yes really). Apparently it was their 75th anniversary, and they were celebrating it by giving out free chocolates. It was 9AM in the morning, and my sleepy eyes retained some energy as cute M&M characters greeted me on the top of the elevator. Not only did they brighten my day, but they also bestowed me the blessed chocolate. I, a very secular being, tried to reject their kind offer, thinking that they would rip the money off of me, but they gave me the chocolate and waved their hands. Wow. A free chocolate! Even though I didn’t look so great that day, I took more than 10 selfies to honor the blissful 75th anniversary of M&Ms. Happy birthday M&M! I will try to buy more of your products from now on! During the weekend, my father invited me over near his office to have a good lunch together. It was a buffet-style lunch and we ate way beyond our own capacities. 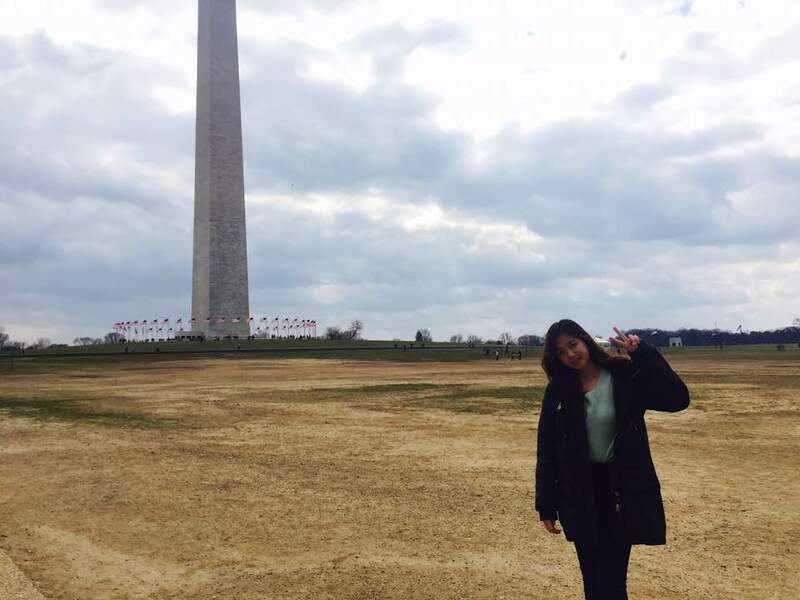 So, we decided to take a walk near the monument. The weather was not so great, but it was warm enough for us to stay out for more than an hour, which hasn’t happened for a while. As we walked past the Lincoln memorial, we arrived at World War II memorial. 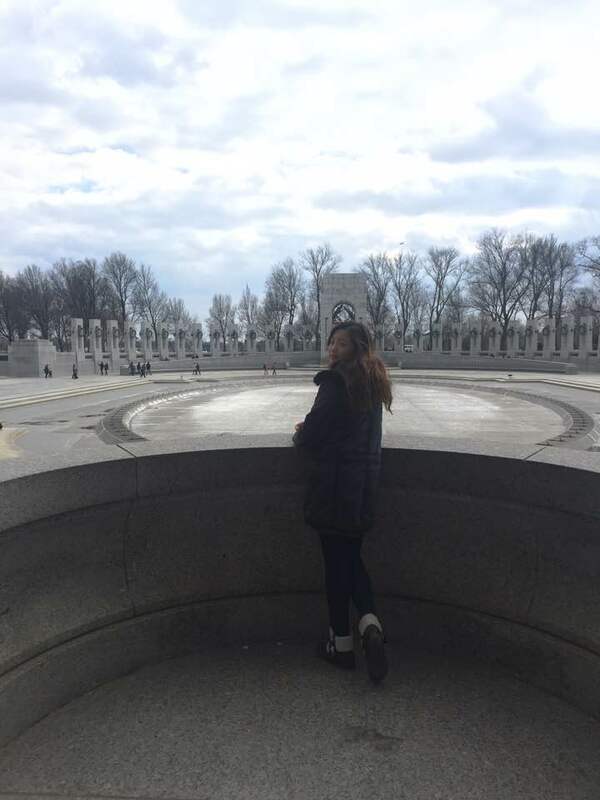 The memorial was not only huge in size, but its design and the atmosphere were compelling enough for me to perceive the dedication and enthusiasm of the ones who fought in the war. The gloomy weather ironically contributed to the memorial looking more grand and meaningful. 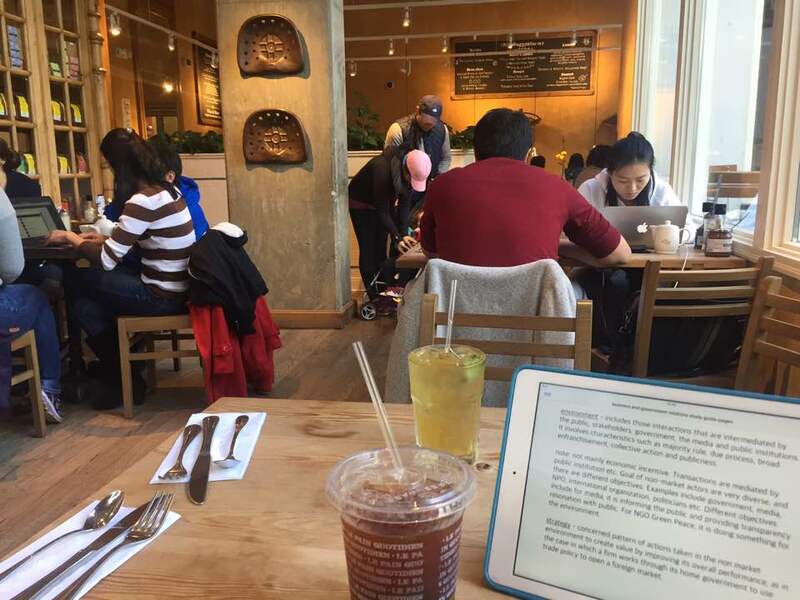 My sister and I went to Le Pain Quotidian to “study.” I was wondering why the name of the cafe was familiar, and I soon figured out that its because the Yonsei student who came to GWU few years ago recommended this cafe on the Study Abroad Program review. 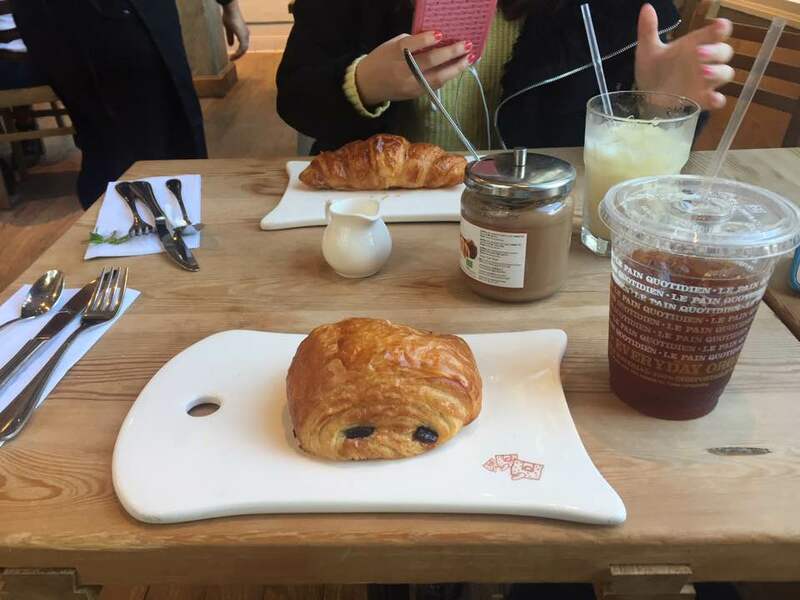 I read the review and ordered the croissant and chocolate bread with much renowned “hazelnut spread.” Hazelnut spread was so amazing that it felt as if I was eating the bread just to enjoy the spread. For drinks, we each ordered Iced Americano and Iced Green Tea. Iced Americano was pretty satisfactory, but my sister didn’t like her green tea. She put in milk, honey, and syrup in order to make it taste better, but it only got worse. But she still finished it! Good for her! Gotta go back to study. I can’t wait till my trip to NYC and Bahamas!!!! 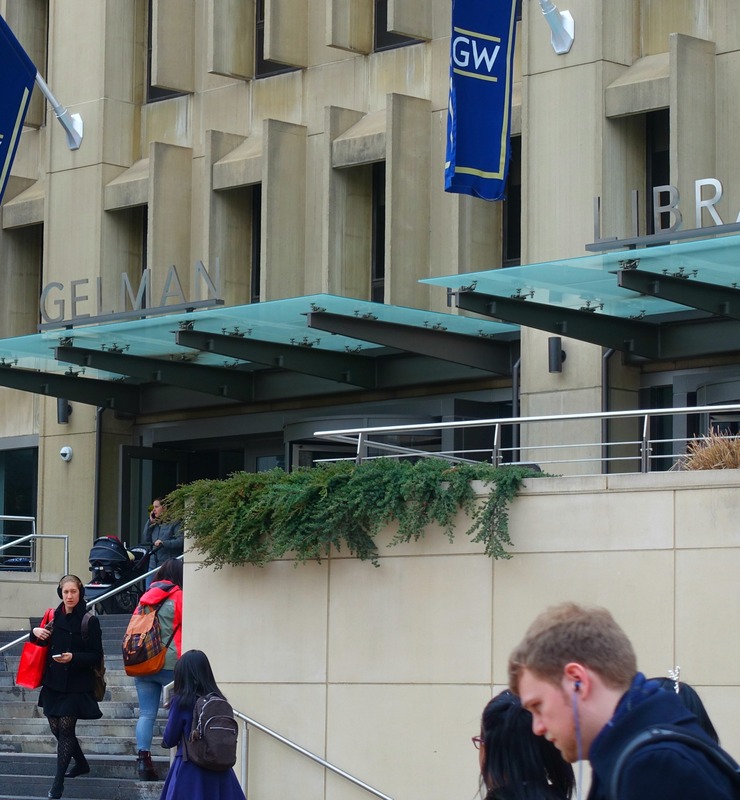 Since I have been studying in the basement of Gelman I have come to notice that at regular intervals a trash trolley will pass me by. The lady who pushes the trolley is kind looking. Calm and consistent, day after day, goes the trolley. Apart from the whirl of the trolley wheels as it passes by, you would never know she was there. Gloria is her name. Gloria is just one of several housekeepers responsible for ensuring that students have a healthy, happy and clean environment that will nurture aspiration and academic potential. “…so, you know, I like to break it up a little. Every holiday, and they will tell you, ‘Veronica is going to come in here dressed as something representing the holiday’. Two weeks before Christmas I have stuff on every day and…” she pauses for effect, grinning like a Cheshire cat, “for the finale… they are just waiting, not sure what I’m going to come in as!” Once, for Halloween, Veronica came to work dressed as a cat. Whiskers and all.”Im told quite often by the people that work here: you are The Sunshine of our Day“. Whether it be the carpet, spills, trash, the bathrooms, picking up year-lost books, housekeepers are kept busy from dawn till dusk. And then our conversation turned to a topic that I had not expected to discuss. Then I brought up the hottest topic of all: TRUMP. Veronica may not stay on as a housekeeper forever. She has already been here for twelve years. 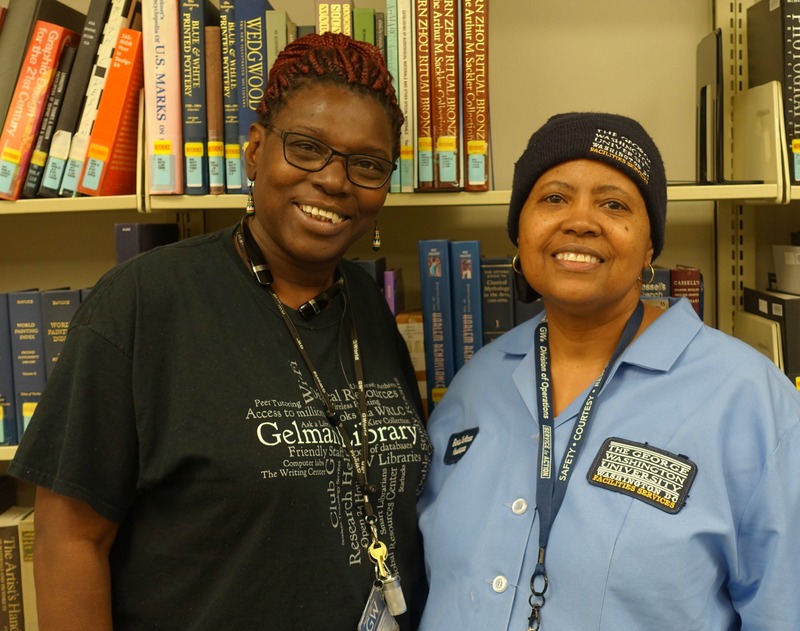 Others, like Gloria, have been housekeepers at GW for more than twenty years. Veronica concludes,”I’d love to do social work. Anything where I’m helping people. That’s what I do…I love to help people“. 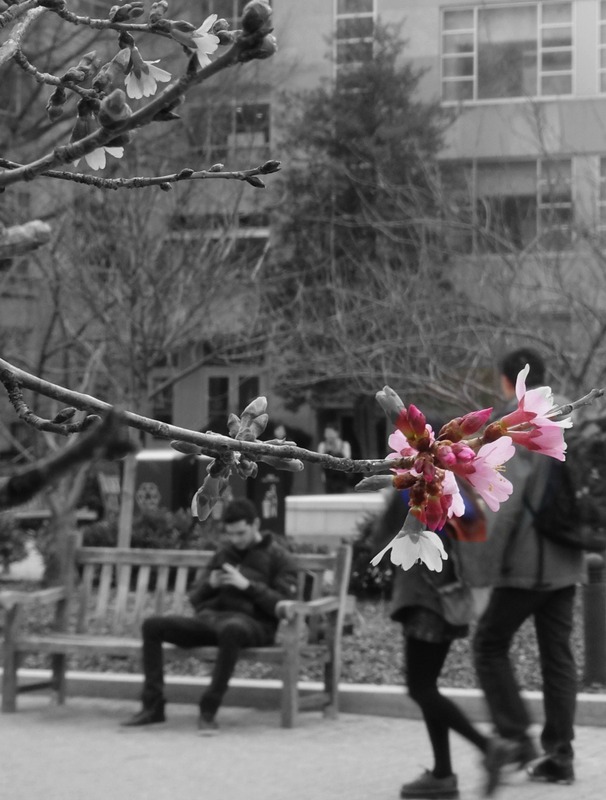 Outside the Library, the Japanese cherry blossoms are beginning to bloom. Few are aware that one of nature’s little miracles is transpiring in Kogan Square. Life is like that. If we look closely, flowers are always blooming in the background. It’s about knowing the right places to look. Back in the basement, silence is broken. It is the whirl of wheels. And the flower passes on by. In the dead of the night the siren wails. A tricolor of pulsing flashes filter through the blinds. Somehow, somewhere in D.C. a smoldering fire has erupted in bright brilliant flames. The siren is answering the call of a concerned grandpa or a watchful mother. Among the fire trucks tearing down the highway is Engine Company 23. It joins weary eyed ambulance and policemen and women; the trinity of emergency services is complete. These service providers are the backbone of any community. There is no hierarchy, each needs the other to function fully. Every day for the past two months I have sauntered past a historic fire station in Foggy Bottom. The very architecture of the building breathes history. The first week of term I was aware of the fire stations presence on campus. 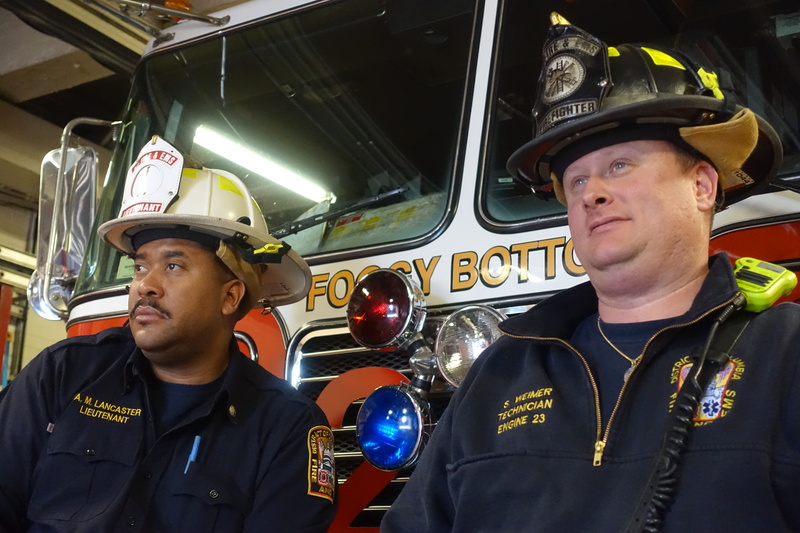 The second week I began to see familiar faces around the station, washing the ‘mother of the station’, firetruck 23. After eight weeks of walking past its walls, I felt I had to dig deeper. Today I entered the station. “Can I help you?” a friendly voice asked. He would later introduce himself as Fireman Shaun Weiner. Fireman Weiner, perhaps in his mid 30s, with piercing blue eyes, kindly offered to show me around the station. I was fascinated by what he shared with me. “Engine Company 23 was established in 1910. 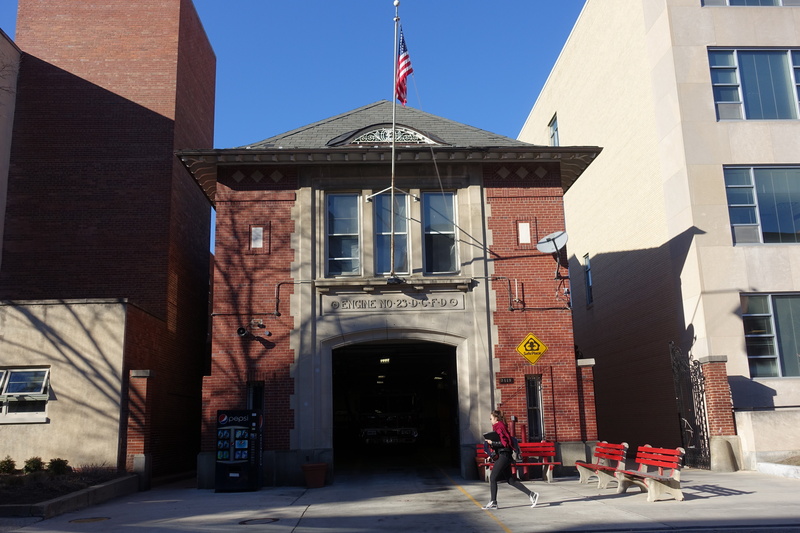 This was the original fire station from then until now. Come over here…” Weiner beckons. I see grooves, like marks. Well, I thought, mum and dad were right when they used to say that the old days were tough – back then they used fire to fight fire! In my mind I envisaged cheeky chestnut Clydesdales nibbling on carrots after a hard night out. Weimer introduced me to Lieutenant Lancaster, the head of the fire station. He invited me into his office and shared some moments from his career. “My great grand daddy took the fireman exam three times. They never let him in. Afterwards it was a tradition in my family to join, and I had several relations who did”. Lieutenant Lancaster wants to retire in good health. After thirty years dedicated to keeping DC safe 24/7 it is a well deserved dream. 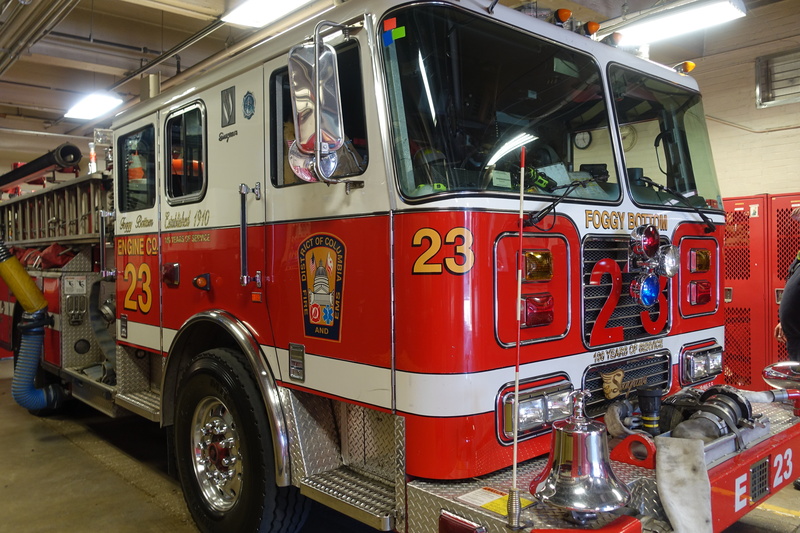 Engine Company 23 has been part of several historic fire fights, including participating in the efforts to contain the fire caused by the terrorist attack on the Pentagon on 9/11. Concluding my tour with Fireman Weiner I asked one final question in regards to the ultimate sacrifice in the line of duty. Those piercing blue eyes veered off into the distance in deep reflection and then looked back to the inquisitive Australian standing before him. We shared a little more about our two respective cultures, shook hands and bid each other good day. As I walk out of the fire station’s gates I turn around. 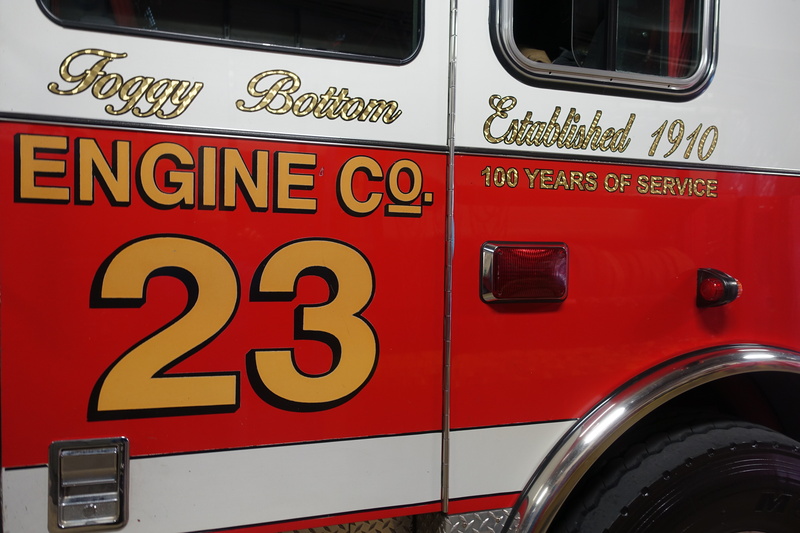 I have gained a deeper respect for the gallant men and at one time, horses, who have inhabited the walls of Engine Company 23 for the past one hundred and six years. They have made a difference every day. Today has been a personal meeting with every day heroes. My eyes are caste high above to the watchtower. At some point some able fireman had the task of climbing the five stories of stairs to chart the quickest route to reach engulfing flames. Beneath the watchtower on the Italianate limestone frontispiece I see Old Glory flutter nobly in the wind. I hear the neighing of the countless teams of horses that served to save. I think about Fireman Weiner’s parting words. For firemen and women their job is more then an occupation, it is family. It is a duty. Suddenly the spectacle is broken: somewhere in the distance a siren begins to wail.